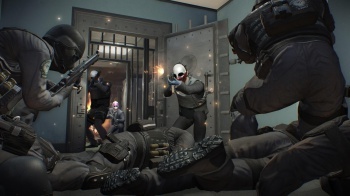 Publisher 505 Games has responded to the lack of availability of Payday 2 on Xbox 360 and PS3. Payday 2 launched in North America last week, but if you're hoping to pick up a physical copy on the Xbox 360 and PlayStation 3, you might be out of luck. Shortages of the team-based first-person shooter have been reported to publisher 505 Games, which is working to get more copies on store shelves. So why is Payday 2 so hard to get? It's just more popular than expected, according to its publisher. In response to a fan wondering why he couldn't find a copy of the game, the 505 Games Twitter account replied, "Payday 2 was a much more popular game than many retailers planned for." Though the shortage is probably frustrating for gamers and the publisher alike, 505 Games appears to be working with retailers to make more copies of Payday 2 available. "We are working hard to remedy this by shipping out more copies daily in order to ensure that store shelves are being re-stocked as quickly as possible," stated a message on the publisher's Facebook page. PC gamers can just download Payday 2 if they so desire, and it should also be available on the PlayStation Network. According to 505 Games' Twitter, it will be on Xbox Live's Games on Demand on August 23, so if you can't find a retail copy this week, that might be your best bet.